The Preferences window allows you to configure important settings, such as Driver, Interface, Sample Rate, Buffer Size, Input Channels and Output Channels. See below for more information on each of these settings. Note that the Preferences window has two sections: the Jack Server and the Jack Router. The Jack Server is the actual "engine" of the JACK Audio Connection Kit. Jack Router takes care of the connections between different applications. Any changes you make to the default settings will take effect after you click on Save. Later on, when you want to quit JACK, the correct procedure is first to click on the Stop button on JackPilot and then to close JackPilot itself (cmd + Q). It is important to note that if you quit JackPilot without having clicked on the Stop button beforehand, you will be closing the user interface called JackPilot, but NOT the Jack Server itself (the "engine"), which in this case will still be running in the background. The following section presents a brief explanation of each of the options in the Preferences window. The information below is adapted from the JackPilot Documentation. You can find the complete documentation inside your Jack folder (Applications > Jack > Documentation.pdf). Driver – the physical audio driver. Choose 'coreaudio', the only option currently available. 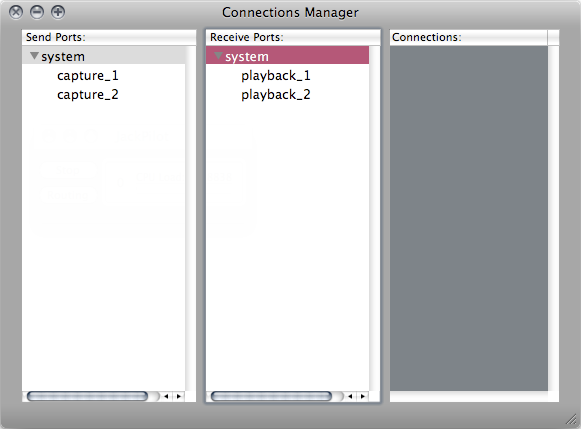 Interface – select the physical audio device that you would like the Jack server to communicate with (for example, a FireWire or USB interface or the built-in audio of your computer). Currently, Jack can only communicate with one hardware audio device at a time. This means that if you have a newer Mac computer (2007 and later) and you want to use your built-in audio input and output, you still have a one-time configuration step to do: create an Aggregate Device, using Audio MIDI Setup. See detailed information on the section Audio MIDI Setup on OS X. 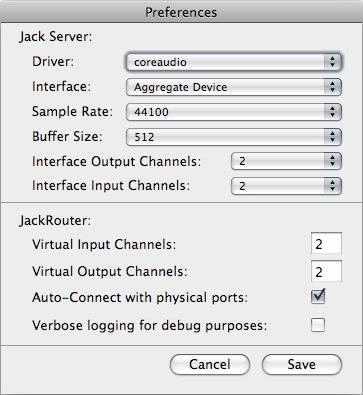 Once this is done, you should be able to choose your newly created Aggregate Device on JackPilot's Preferences window. This will allow you to use JACK and Ardour with your computer's built-in input and output. Sample Rate – choose your desired sample rate for the Jack server. Only sample rates supported by the selected Interface will be displayed. If in doubt, leave the default. Virtual Input Channels – the number of virtual input channels Jack will provide for each application. Typically this should be set to 2, for stereo operation. Virtual Output Channels – the number of virtual output channels Jack will provide for each application. 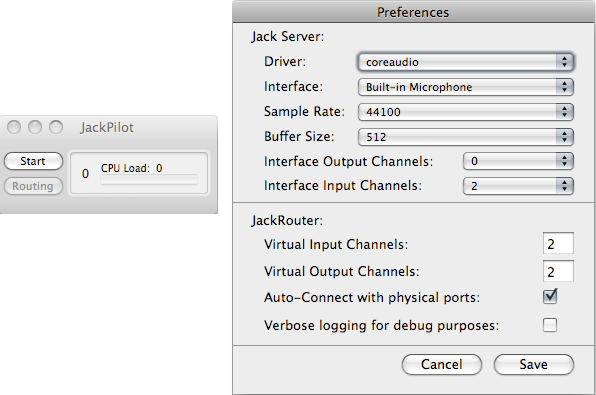 Auto-Connect with physical ports – check to allow JackPilot to automatically connect the Virtual Input and Output Channels to your physical audio device input and output ports, respectively. Verbose logging for debug purposes – check to allow Jack OS X to write more complete log messages to the Console, which is useful for debugging in problem cases. Once you have chosen your settings, click on Save to exit the Preferences window. Note that the Preferences can only be changed when the JACK server is stopped, not when it is running. This section will help familiarize you with JackPilot's routing interface. With the Jack server on, click on the Routing button in JackPilot to bring up the Connections Manager window. The following is an example of what you might see if you had not yet Jack-enabled any applications. All you see is the physical audio device (generically called “system”) and its send (“capture”) and receive (“playback”) ports. 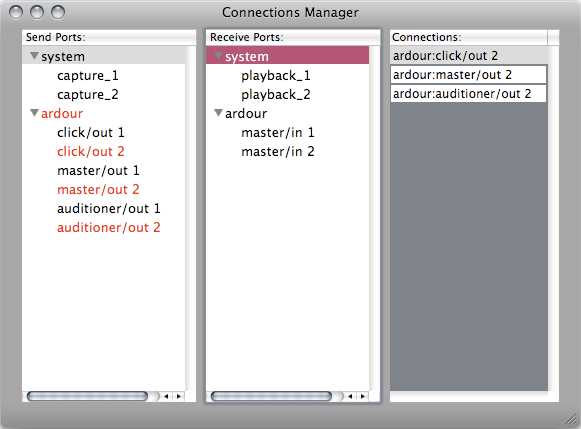 Managing Ardour connections may be done in this window, or this may be done entirely from within Ardour. The result is the same. 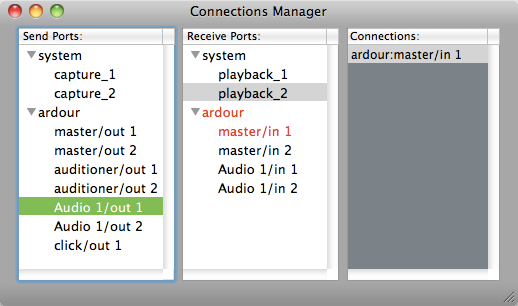 If you will be working only with Ardour, you probably won't need to come back to JackPilot Connections Manager at all. However, as you start doing more complex connections between different audio applications, you may need to use JackPilot Connections Manager. For more information, please refer to the JackPilot Documentation.